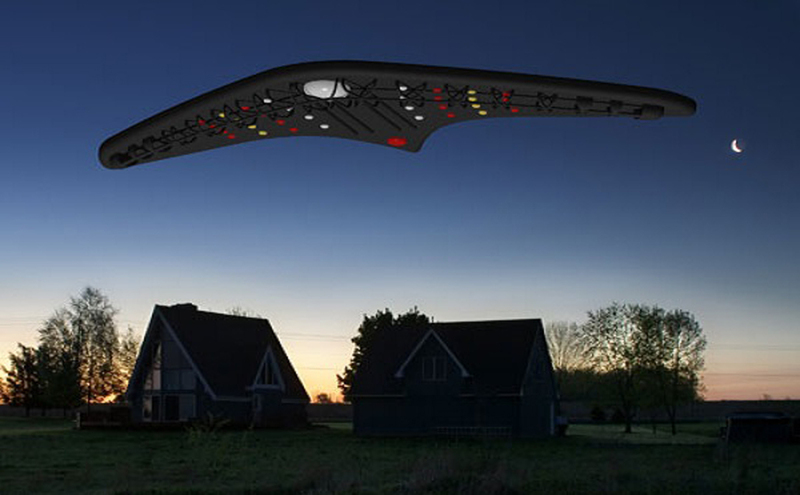 "I witnessed a Dark boomerang craft, no lights, gliding across O'Fallon. This blended perfectly in the night sky, so it's a miracle I noticed it; the movement caught my eye. "It's hard to estimate the size, since I would first have to estimate the altitude but I'd say it was lower than any airplane I've ever seen fly; maybe a few hundred feet. The angle I saw was side to belly of the craft. I viewed it for about 10-15 seconds before I lost sight of it due to trees and the line of sight. "It looked like it had a wing span, likely V-shaped. There were no lights whatsoever. It looked dark grey in color (it was a very clear night here in St. Louis tonight). There was no sound; it was graceful, it glided utterly silently in the night. "This will sound even crazier, but it left behind a sort of very subtle blurry end trail as went by. The trail it left looked sort of distorted, wavy... like the street on a hot summer day. "I don't know who to report this to. Should I call the police? It's been almost 2 hours now, and I haven't heard anything about it on the radio, news or internet. It was so discreet that I now find myself thinking these things could be out here every night and no one might see them unless they got lucky like I did. "This was creepy. Does this sound like a military operation/practice? Maybe it was a surveillance drone or something like that."